My friend, Peta Peace of She Quilts A Lot (who I finally got to meet in person at quilt market this past spring!) has a new book that just hit the stores called A Piece of Cake. 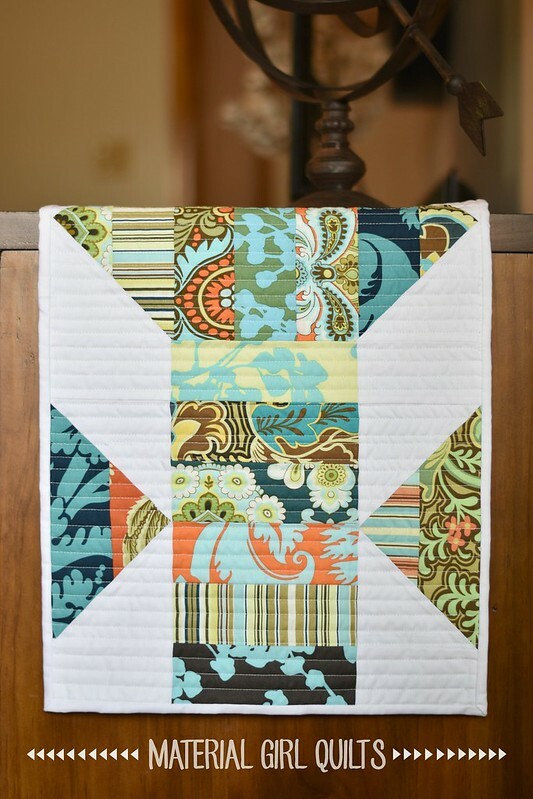 It’s full of beautiful quilt patterns made using 10″ layer cake squares. When she asked if I would like to participate in a blog hop to promote the book, I was thrilled. Peta has created some wonderful patterns and the book itself is gorgeous to flip through. I chose to make the Bright and Breezy Runner pattern (Peta’s version from the book is pictured below). I pulled out my long hoarded Belle layer cake by Amy Butler and decided to use only the orange and turquoise colorways. The pattern in the book finishes at 14 1/2″ x 52 1/2″, however I wanted mine to be a bit longer, so I simply pieced together two more blocks and it now finishes at 72″ in length. Here is the result. It is not easy to photograph a table runner! Hanging it off the end of our entertainment center seemed like the best option. I also tried to hang it outside like I do my finished quilts, but that just looked silly…here is a close up from that attempt. And here is the runner in its new home (see, not easy to photograph the entire thing!). Now head over to the blogs linked below to see what everyone else has been making! 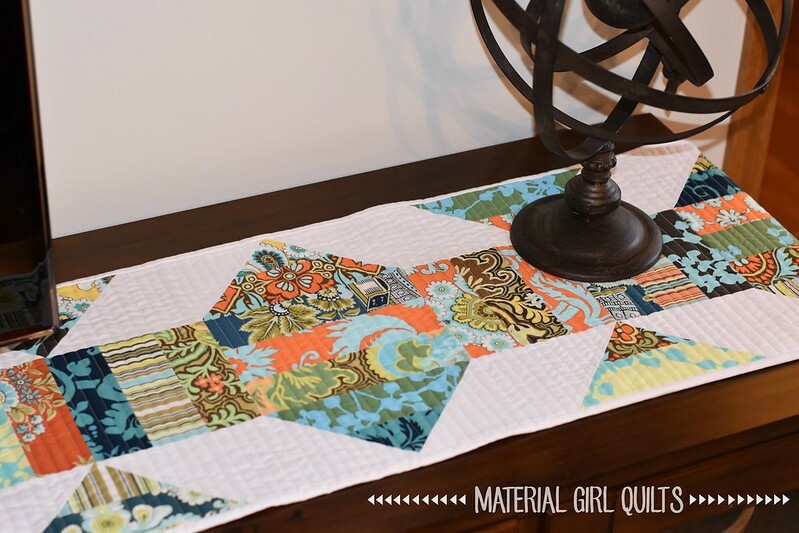 4 Sept Amanda – Material Girl Quilts – YOU ARE HERE!! You can also follow along with the Book Tour on Instagram with the hashtag #apieceofcakebook. To make things easy that’s also the hashtag you can use for any projects you make :). 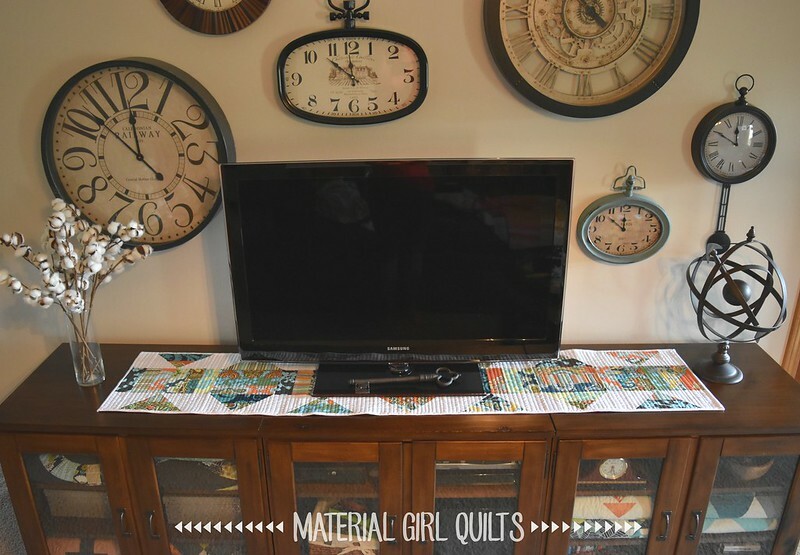 Table runners are one of my favorite projects because you can try out a quilt pattern in a smaller way. I do agree taking those table runner photos is tricky! You did a fantastic job on both the runner and photos! Love your wall of clocks too! 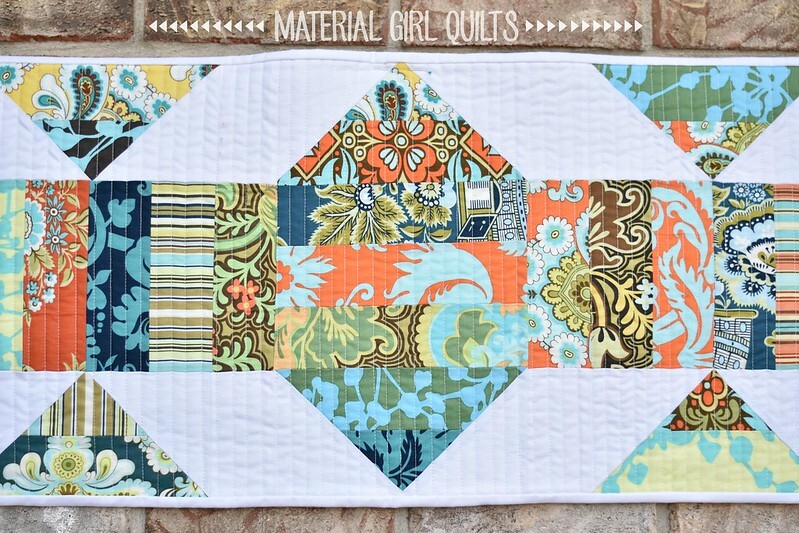 So stunning projects.I love tje runners but the quilt caught my eye. Beautiful table runner. I am loving table runner patterns at the moment. They make lovely gifts and they are quicker to make than a quilt sometimes. NEAT TABLE RUNNER! PETA’S BOOK LOOKS SO GREAT!!! THANKS FOR SHARING! Your table runners are gorgeous, and so fresh and contemporary looking! Love them!